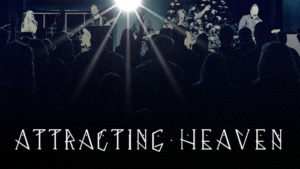 In Attracting Heaven we are going to be exploring the subject of worship. Some think of worship as singing songs in church…and that’s part of it…and yet there is so much more. But why does worship matter? Why do we sing in church? What’s the point? If you love to sing, if you hate to sing, if you don’t get it, or long to get it, this series will be perfect for you. See you Sundays during Attracting Heaven!